COTE BASTIDE GROOMING REVIEW - Grooming brand that I was not familiar with, but I definitely one of the best amenities that I have ever tried, thanks to Montigo Resort Nongsa. 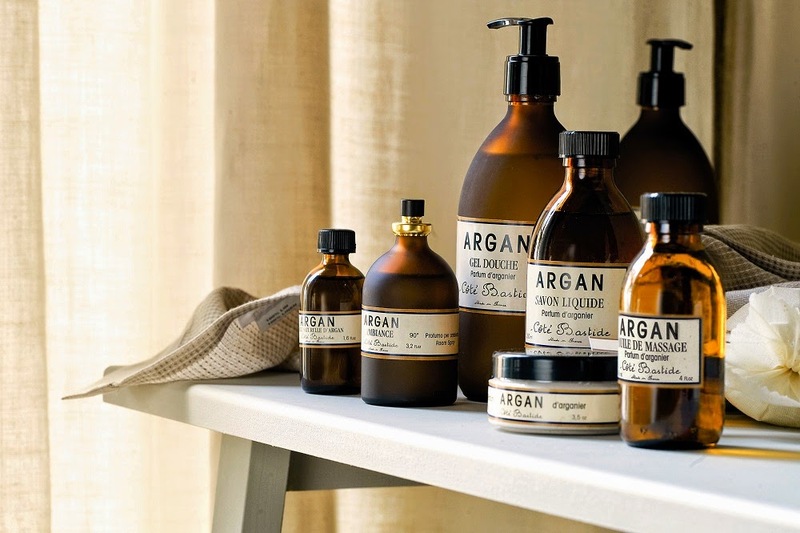 At first I thought, the official bath amenity would be Malin+Goetz (that I'm also crazy about it), but we got "Argan" instead, it looks very classy like Aesop but it wasn't, and the things the brand is Côté Bastide, not Argan, so you will not find anything about this Argan on the internet, unless the keyword is Côté Bastide. So my experience with Côté Bastide was pretty awesome. One night I was want to do my resort ritual of bubble bathing, but I didn't find any bubble bath liquid in bathroom. I called the room service to brought me bubble bath, they came to me and brought me like 6 bottles of Gel Douche (I mean Gel Douche is like shower gel, it's totally different with bubble bath - Ok I said I will use them all), but instead of use all 6, I only used 1 bottle, this Gel Douche was totally supper bubble maker, I'm impressed. The smell is sweet, fruity like peach and pretty milky for the moisturizer. If you can imagine Sugus candy.. it reminds me of this Argan grooming kit by Côté Bastide. Me like its sweetness! Côté Bastide has been cultivated in the light of Southern France since 1992. From her secret garden, Nicole Houques has offered us the refined sweetness of perfumed notes, the beauty of a silent gesture, and all the precious details that we consider moments of happiness. Her inspiration has come from the serenity of the landscapes of Provence and Tuscany as well as The Orient. Our products are about quiet mornings in the countryside and pleasant travels though Provence. It is here that the sun and spirit give rise to the subtle touches of life and the irresistible charm of nature. These unique attentions marry the simplicity and the refinement, the innocence with the authenticity, and the details with the essential. The profound desire to reawaken the senses, to regain lost feelings, and to capture our memories. In a sense, to remind us of the simple pleasures in life. The rare yet familiar scent of an age old rose, the charm of handcrafted earthenware, the craftsmanship of bundled and tied cinnamon, and the touch of a pristine cotton sheet. Côté Bastide rediscovers the daily pleasures which are to be enjoyed and shared, and never to be forgotten. LOVE your photography!!! GREEEAT shots! Esp near the pool! Makes me want to use those products and go on vacay!!! Stunning!